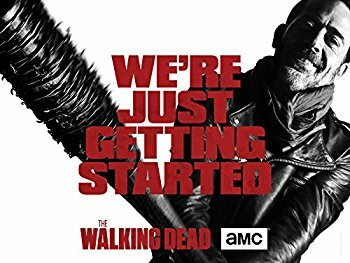 I haven't actually watched last night's episode yet, but I wanted to link to it on Amazon for those who watch it. Here is Episode 7.1 The Day Will Come When You Won't Be, which is available in either SD or HD, or you can also get a season pass. I watched the episode and it was traumatic! I was stumbling around looking for a safe space afterwards. I literally had my hands over my eyes during the last bit. Very painfully brutal both physically and emotionally for the characters! I am scared to watch next week's episode. Still no watch? Want to read your thoughts. Was worse than Outlander in the breaking of a man. I watched it last night and I am SO traumatized that I had to scarf down chocolate right after. I literally had my hands over my eyes during the last bit. So brutal! I think I hate this show right now. I think they need to have Maggie step up her game fast. I need something to root for. Next week looks like it'll be a snooze. Morgan is agonizingly boring and defeated Carol is no fun. Did you watch it on Amazon? So much better without ads. Tried Sling. Not worth 20/mo for 1 show. 8/mo to buy SD I just couldn't wait until Monday morning.